The first consideration is the real slow start by Mutai this morning!! !20 sec of gap already in first 5k are too much in my opinion when u want to try WR.The gap is became bigger at 10k (+4sec) at 15k (+5sec) at 20k (+2sec).31 sec in 20k of race...too much for me!! Negative split appears first time from 20k to 21,097 where Mutai closes the first time 4 sec to Makau-time (3'10 instead 3'14). Other 8sec were reduced by Mutai from half to 25k but Geoffrey couldn't do anything between 25k and 30k where Patrick had realized last year an amazing 14'20 even if Geoffrey waken up and run an excellent 14'33. 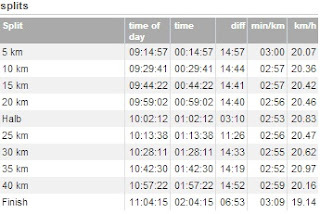 Mutai-show happened between 30k and 35k when he run that 5k in 14'19 instead 14'38 of Makau making an incredible difference with 32k in 2.43 and 33k in 2.48. Others 7sec closed by Mutai over Makau between 35k and 40k timing 14'52 over 14'59' of Makau. But...incredibly Mutai has lost everything in last 2,195km where he run 6'53 instead 6'23 of Makau...30 sec lost!! !absolutely strange! !Maybe Kimetto with him created some troubles? ?Maybe really tired also Mutai? Maybe starting a little bit faster even if second half 9sec faster than first half?? Curious to know your opinion about why Mutai failed WR.. If u love statistics... HERE a good link where Ken Nakamura of www.trackandfieldnews.com recap something about today..